We predicted theoretically and prove experimentally the effect of non-reciprocal loss in hybrid semiconductor/ferromagnetic metal waveguides. This effect can be use for new design of waveguide optical isolator. Because the structure of this isolator is similar to that of laser diode, such design is beneficial for integration. The hybrid waveguides experience the non-reciprocal loss because of transverse MO effect. Both types of isolators, either made of Cd1-xMnxTe or made of garnets, required high-crystal quality materials in order to have a low optical loss and a high value of Faraday rotation. In the case of Cd1-xMnxTe, the magneto-optical film can be directly grown on a semiconductor substrate. The defect density in Cd1-xMnxTe film should be kept low until the end of the microfabrication process. For the fabrication of integrated optical circuits it is more convenient to use common fabrication technique like sputtering, e-beam evaporation and lift-off. Ferromagnetic metals, like Fe, Co or Ni are very attractive for this purpose. They have high magneto-optical constants and the microfabrication of these metals is simple and well established for optoelectronic integrated circuits. For example, Cr and Co is often used as a metal for Ohmic contact to p-GaAs and p-InGaAs. We predicted theoretically and proved experimentally the effect of non-reciprocal loss in hybrid semiconductor/ferromagnetic metal waveguides. This effect can be use for a new design of waveguide optical isolator. For this design, the magnetization of the ferromagnetic metal was perpendicular to the light propagation direction and lay in the film plane (Voigt configuration). In this case a large difference exists in values of loss/gain for TM modes propagating in opposite directions. Thus, an amplifier covered by a ferromagnetic metal can itself function as an optical isolator. This ferromagnetic-metal/ semiconductor hybrid isolator can be beneficial for monolithic integration of the optical isolator with semiconductor optoelectronic devices, because its structure is very similar to the structure of a laser diode and its fabrication process is almost the same as that of a laser diode. Therefore, the isolator can be integrated utilizing the present technology for a semiconductor laser diode and a semiconductor amplifier. The effect of the non-reciprocal loss is unique for the hybrid waveguides. In a case of the light propagation in a bulk MO material the non-reciprocal effect (variation of optical properties for opposite directions of light propagation) occurs only when the magnetization of the material is parallel to the light propagation (Faraday effect and magnetic circular dichroism). There is no non-reciprocal effect, if the light propagates perpendicularly to the magnetization. On the contrary, in a MO waveguide, even if the magnetization is perpendicular to the light propagation direction and lies in the film plane, the TM mode has a non-reciprocal change of the propagation constant. The hybrid waveguides experience the non-reciprocal loss because of transverse MO effect. The effect of non-reciprocal loss has another simple explanation. The propagation of waveguide mode can be considered as a plane wave, which propagates in the waveguide core and experiences multi reflections from boundaries of waveguide. If the magnetization of the metal is perpendicular to the plane of reflection, the plane wave experiences the transverse Kerr effect. The transverse Kerr effect states that if the reflection plane of the light is perpendicular to the magnetization of the metal, the absorption by the metal is different for two opposite directions of the magnetization. Therefore, the plane wave experiences different absorption for opposite propagation directions. The optical isolation of the amplifier covered by ferromagnetic metal can be calculated by solving Maxwell's equations for multilayer structure. As an example of the waveguide isolator operating at a wavelength of 790 nm, we consider a GaAs0.9P0.1/Al0.3Ga0.7As quantum-well (QW) optical amplifier covered by a Co layer (Fig. 1). 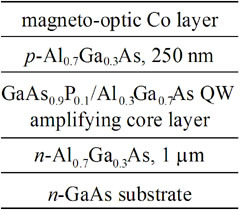 To reduce the absorption by the Co layer, a buffer layer of p-Al0.7Ga0.3As is inserted between the absorbing Co layer and GaAs0.9P0.1/Al0.3Ga0.7As QW amplifying core layer. The optical field of a waveguide mode exponentially penetrates through the buffer layer into the Co layer. 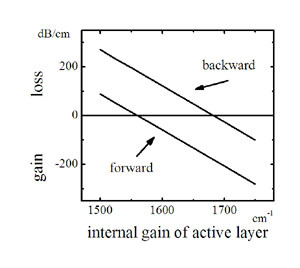 Figure 2 shows the dependence of the optical loss/gain for the forward and backward propagating modes as a function of internal gain of the GaAs0.9P0.1 active layer. Depending on the value of the internal gain, the waveguide can operate as a non-reciprocal amplifier (internal gain >1680 cm-1) or as a non-reciprocal absorber (internal gain <1560 cm-1) or as an isolator (1560 cm-1> internal gain >1680 cm-1). The isolation ratio is almost constant against internal gain and it is about 180 dB/cm. Because the waveguide mode interacts with the MO Co layer by its exponential tale through the buffer layer, the non-reciprocal loss/gain depends on the thickness of the buffer layer. Figure 3 shows a dependence of the isolation ratio and the internal gain of GaAs0.9P0.1 active layer as function of the thickness of the p-Al0.7Ga0.3 As buffer layer when the value of loss for the mode propagating in forward direction is kept to be zero. 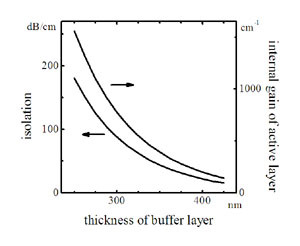 The thinner the buffer layer is, the larger isolation ratio can be obtained, although the higher amplification is necessary to compensate the loss. 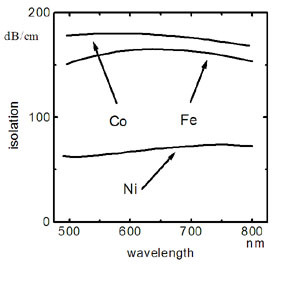 Figure 4 compares isolation ratio of structure of Fig.1 with Co, Fe and Ni cover layer. Wavelength dependence of optical constants of Co, Fe and Ni are taken into account, while optical constants of amplifier are assumed to be independent of wavelength. Among these materials the cobalt is the most suitable for the proposed isolator. The isolation ratio only slightly changes vs. wavelength. Therefore, the wavelength dependence of the isolator is determined only by the bandwidth of the amplifier. The proposed design of the isolator does not require the periodical reverse of magnetization or the phase matching between TE and TM modes or the interferometer structure. It provides the high isolation ratio in a wide range of the internal gain. The isolation ratio is proportional to the isolator length. These all merits make this design suitable for the monolithical integration of optical isolator with optoelectronic devices. It should be noted that MO materials (ferromagnetic metals, magnetic semiconductors and magnetic garnets) show the highest values of the MO effect in a wavelength region where they show large absorption. Thus, the combination of the absorbing MO materials with the optical amplifiers is a viable way to achieve smaller sizes of non-reciprocal devices, which is suitable for integrated circuits. Fig.3 Isolation ratio and the required internal gain of GaAs0.9P0.1 active layer vs. thickness of p‑Al0.7Ga0.3As buffer layer. The loss/gain of the mode propagating in forward direction is fixed to be zero. For the experimental verification of the effect of non-reciprocal loss, we fabricated passive optical waveguides covered by a ferromagnetic metal. The directional dependence of absorption by the metal is a reason for the isolation in this structure. The optical gain in the isolator is used only to compensate the loss. To avoid side effects due to the optical amplification, we studied a passive waveguide covered by a ferromagnetic metal. Two identical waveguides were fabricated, where only the material of buffer layer between Co layer and waveguide core was different. Figure 5(a) shows the structure of a Ga1-xAlxAs waveguide covered by Co with SiO2 buffer layer and Fig. 5 (b) shows the waveguide with AlGaAs buffer layer. The Ga1-xAlxAs waveguide was grown with molecular-beam-epitaxy (MBE) on a GaAs (001) substrate. Following a 2500-nm-thick Ga0.55Al0.45As clad layer and a 900-nm-thick Ga0.7Al0.3As core layer, a buffer layer of 12-nm-thick SiO2 or 120-nm-thick Ga0.55Al0.45As was grown. The 10-mm-wide 600-nm-deep rib waveguide was wet etched. A 100 nm of Co layer and a 100 nm of Au layer were deposited on the buffer layer. A protection layer of 100-nm-thick SiO2 with 8-mm-wide window was used to avoid light absorption at the sidewalls of the waveguide. For the evaluation of non-reciprocal loss, laser light (lambda=770 nm) was coupled into the waveguide with a polarization-maintaining fiber. The output light was detected by a CCD camera. A polarizer was placed in front of the CCD camera. The magnetic field was applied perpendicularly to the light propagation direction and in the film plane with an electromagnet. Fig.4 Isolation ration vs. wavelength. Wavelength dependence of optical constants of Co, Fe and Ni are taken into account, while optical constants of amplifier is assumed to be independent on wavelength. Figure 6 shows the transmission coefficient of TM mode as a function of applied magnetic field for the waveguide with SiO2 buffer and the waveguide with Ga0.55Al0.45As buffer. A clear hysteresis loop of the transmission coefficient was observed with a coercive force of 35 Oe. The transmission coefficient of TE mode showed no dependence on the magnetic field. The magnetization curve measured by a superconducting quantum interface device (SQUID). For both samples magnetization curve was identical and the coercive force was 35 Oe. The observation of the hysteresis loop of the transmission coefficient of TM mode with the same coercive force is that of Co proves the TM mode transmission depends on magnetization of the Co. Considering time-inversion symmetry, the difference of transmission in the same direction of light propagation for two opposite directions of magnetic field is equal to the difference in transmission for opposite directions of light propagation in one direction of magnetic field. Therefore, the amplitude of the hysteresis loop of the transmission corresponds to the isolation provided by the waveguide. As can be seen from Fig. 6, the isolation direction for a waveguide with a SiO2 buffer is different from that for a waveguide with a Ga0.55Al0.45As buffer. Therefore, the isolation direction depends not only on the magnetization direction of the ferromagnetic metal, but on the waveguide structure as well. Fig.5 AlGaAs optical waveguide covered with Co. Either a) SiO2 or b) Al0.45Ga0.55As was used as the buffer layer. Waveguide light propagates in the core layer and slightly penetrates into the Co layer. These results can be explained by considering two contributions to the non-reciprocal loss by MCD and Faraday effects. We defined the figure-of-merit (FoM) for this isolator as a ratio of the non-reciprocal absorption to the total absorption by the metal. The mode propagation constants, non-reciprocal loss, and FoM were rigorously calculated from a direct solution of Maxwell's equations for the planar waveguide. In addition, both MCD and Faraday contributions to FoM were roughly estimated by estimating the light energy dissipation resulting from each contribution. For the waveguide with SiO2 buffer, FoM was calculated to be 7.95%, where MCD and magneto-reflectivity contributions were estimated as -8.01 % and 15.86%, respectively. For the waveguide with Ga0.55Al0.45As buffer, FoM was calculated to be -7.19%, where MCD and Faraday contributions were estimated as -8.01 % and 1.11 %, respectively. The sign of the contributions is different. The magnitude of the MCD contribution is almost same for both waveguides. On the contrary, the magnitude of Faraday contribution is significantly different. That is a reason that opposite isolation directions were observed in the waveguides with SiO2 and Ga0.55Al0.45As buffers. For both waveguides the sums of the MCD and Farady contributions are approximately equal to the FoM calculated from the rigorous solution of Maxwell equations. Fig.6 Optical transmission in 1.1-mm-long Ga1-xAlxAs optical waveguides covered by Co at lambda=770 nm as a function of applied magnetic field a) with SiO2 as the buffer layer and b) with Ga0.55Al0.45As as the buffer layer. Next, we verify the isolation in the optical amplifier covered by the ferromagnetic layer. Figure 7 (a) showed the fabricated isolator. The optical amplifier consists of 8 In0.46Ga0.54As/In0.26Ga0.74P tensile strained quantum wells grown on n-InP substrate. The p-InP was used as buffer layer and InGaAs as a contact layer. The amplifier has maximum amplification at l=1566 nm. Figure 18 (b,c) shows the intensity of amplified spontaneous emission (ASE) as a function of applied magnetic field measured at both edges of the isolator, when the weak injection current of 10 mA was used. At each edge, a hysteresis loop was observed for ASE , however the polarity of the loop was different. It is because there is difference in gain for the light propagating in forward and backward directions in the amplifier. Fig.7 a) InGaAs/InAsP optical amplifier with Co contact.Amplified spontaneous emission measured b)from left and c) right edge under small 10 mA injection current as a function of applied magnetic field. T. Amemiya; H. Shimizu; M. Yokoyama; P. N. Hai, M. Tanaka & Y. Nakano (2007), "1.54-mm TM-mode waveguide optical isolator based onthe nonreciprocal-loss phenomenon: device design to reduce insertion loss " Applied Optics vol. 46, No. 23, 5784 , Aug. 2007. V.Zayets & K. Ando (2005), "Isolation effect in ferromagnetic-metal/semiconductor hybrid optical waveguide" Applied Physics Letters , vol. 86, No. 26, 261105, June 2005. W. Zaets & K. Ando (2001), "Magnetically Programmable Bistable Laser Diode With Ferromagnetic Layer" IEEE Photonics Technology Letters. vol. 113, No.3, 185-187, Mar. 2001. W. Zaets & K. Ando (1999), “Optical waveguide isolator based on non-reciprocal loss/gain of amplifier covered by ferromagnetic layer”, IEEE Photonics Technology Letters vol. 11, No.11, 1012-1014, Aug. 1999.